From aphids sucking the sap to caterpillars and slugs voraciously chewing their way through the foliage, the summer garden teems with a huge variety of life that seems to view our beds and borders as little more than an ever-open snack-bar. As if that wasn’t enough to contend with, there’s a range of moulds, fungi and viruses waiting in the wings to wreak their own particular kind of damage too. 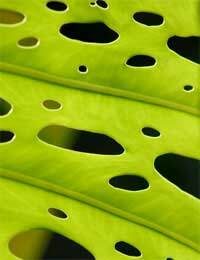 Damage to the leaves, flowers and flower buds are most usually caused by insects and other invertebrate pests. If you do start to see holes and tears on your plants, it’s worth investigating it thoroughly to see what’s causing the problem. Sometimes where the damage is located can give a bit of a clue as to the likely culprit. The larger and less agile kinds, for instance, such as slugs and snails tend to concentrate their attentions on lower leaves, though even they can sometimes be found higher up the plant if the prize is particularly tender or succulent. On the other hand, Capsid bugs and many kinds of moth caterpillars – including the likes of the Rosy Rustic, Buff-Tip and the Garden Tiger moths, along with cabbage whites and the various loopers – attack more widely, potentially causing damage to any of the above-ground parts. However, it’s worth bearing in mind that not all tears are pest-related; an unexpected frost, for instance, can cause this kind of damage in unprotected tender plants, while strong winds can sometimes split some kinds of leaves, especially long ones such as cordylines or hardy ornamental palms. The first sign of an infestation of aphids or other sap suckers tends to be when you spot them on the plant, rather than any actual damage. As with most pests, it’s often easier to deal with them before they multiply out of hand, so it’s a good idea to check susceptible plants, such as roses, regularly to try to catch them early. Before they become noticeable all over the plant, the first aphids can often be spotted in and around new shoots and on the underside of leaves and sheltering in the petals and sepals of young flower buds. If you inspect these areas regularly, even if there’s no outward sign of these pests elsewhere, you should have enough early warning to be able to take appropriate action quickly and minimise the damage they can do. Rusts affect a number of different kinds of plants – though vegetables seem to suffer less than flowers and trees. There are many kinds, but in general, the first sign is the appearance of raised orange, brown or black spots on the leaves or stems of affected plants, with the likes of antirrhinum, pelargonium, carnations, rhododendron, mahonia and willow being particularly prone to rust. Diseased leaves should be removed and burnt, any overcrowding reduced and the plants treated with a high-potash fertilizer; rose rust – a rare but serious and often fatal disease of roses – has been linked to cold springs, hard winters and a shortage of potassium in the soil. If your roses start to show rust symptoms – typically orange swellings on the undersides of their leaves, which turn black in late summer – they will need swift treatment with an appropriate pesticide as soon as possible if they are to stand the best chance of surviving. In warm, dry summers, powdery mildew can be a major problem for a range of plants such as chrysanthemum, michaelmas daisies, peas, cucumbers and grapes, starting off as a white powder on the leaves which gradually spreads and darkens as the year progresses. It tends to thrive when plants are overcrowded and particularly if the roots are regularly allowed to dry out – so avoiding these conditions can be a big help in stopping it from being a problem. By contrast, in cool, wet surroundings, grey mould – or botrytis – presents a serious threat to many kinds of plants, especially if they are being grown where the air flow around them is poor. This mould enters through damaged areas of the leaf or stem and can ultimately spread to all of the above-ground parts of the plant. At first the areas affected turn brown and soft to the touch, the characteristic pale grey cotton wool like mould which gives it its name developing later. Botrytis is most likely to occur in spring and autumn, when the conditions in the garden are most suitable for it to spread. When it comes to keeping leaf and stem pests at bay – and our plants looking good – there really is no substitute for vigilance, and if you can recognise the signs of infestation early enough, in most cases you’ll find controlling them becomes a great deal easier.